Lots of email about the Chris Berman retrospective and, because in my Tuesday piece on Berman I didn’t say what I thought of the man, I’ll do that here. But first, let’s look at the coaching carousel, which appears to be moving much faster than we thought a few days ago. • Denver. The Broncos seem to have it down to two, with Dolphins defensive coordinator Vance Joseph having a slight edge over Falcons offensive coordinator Kyle Shanahan. But Joseph was scheduled to leave Denver after an interview Tuesday to keep appointments with the Chargers on Wednesday and the 49ers on Thursday. However—and this might be significant—Joseph had dinner with Elway after their interview and Joseph had not left Denver as of late Tuesday night and was scheduled to stay until this morning. “He has great leadership qualities and a strong vision of what it takes to win,” GM and decider-in-chief John Elway tweeted Tuesday. Longtime Broncos beat man Mike Klis says special-teams coach Dave Toub of Kansas City is still in the equation too. It’s still too early to think Joseph—who then would have a need to build an offensive staff while retaining most defensive assistants, a bit of an awkward scenario—is the better fit over Shanahan. But I’ve heard Elway and club president Joe Ellis were extremely impressed by the Shanahan interview, and that narrowed the early gap between he and the more well-rounded manager he thinks Joseph is. So we’ll see. 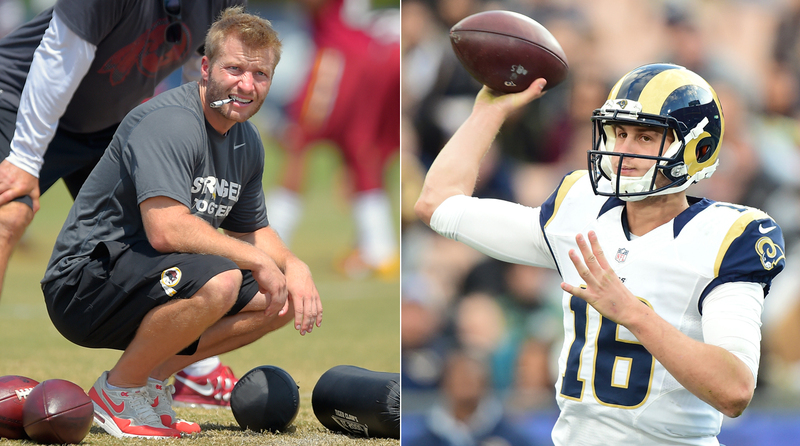 The Rams are considering hiring offensive guru Sean McVay, who would inherit young quarterback Jared Goff. • Los Angeles. There’s always a candidate that comes out of the blue. This year’s guy is growing on the Rams, and fast. The Rams are serious about 30-year-old offensive coordinator Sean McVay of Washington. (Well, he’s not so young. He does turn 31 in two weeks.) He was the play-caller in Washington the past two years under Jay Gruden, and the grandson of Bill Walsh’s director of football operations in San Francisco is well respected by his players. When the Rams interviewed McVay, they found a guy who was totally un-awed by the prospect of being the youngest head coach in the league. He’s been training for it under Gruden. “I’m sure,” Gruden told our Andy Benoit last summer, “he’ll be a head coach a lot sooner than people think.” If McVay’s the call over Houston assistant Mike Vrabel or Buffalo interim coach Anthony Lynn (the Rams loved Lynn when they spoke Sunday), he’ll have to build a veteran staff to help him negotiate the stuff he doesn’t know. But the prospect of McVay, who helped tutor Kirk Cousins into respectability, working with top 2016 pick Jared Goff might be most attractive to the Rams. Keep in mind that owner Stan Kroenke has to approve all hires, and he hasn’t met with the youngster yet. So set nothing in stone here. • San Diego. The Chargers favor a candidate with head-coaching experience, which gives former Falcons coach Mike Smith (seven-year mark in Atlanta: 67-50) a leg up. But that’s not a must. The choice will have to be flexible, in case the franchise moves to the Los Angeles ‘burbs this fall and plays as an orphan for two years while the Rams/Chargers palace dreamed up by Rams owner Stan Kroenke is built. Toub is in play here, as is Joseph (slated to interview Wednesday). All along, a defensive coach has seemed to make sense here, with so much young talent on that side of the ball. If not Smith or Joseph, Detroit defensive coordinator Teryl Austin is also liked in San Diego. • San Francisco. The Niners know they’ll have to stretch for one of the young stars (Josh McDaniels, Kyle Shanahan), as in a very long-term contract and willingness to allow the pick to help overhaul the culture of this suddenly downtrodden organization. They seem willing to do that, and to lower expectations for the next couple of years while the franchise is rebuilt. An offensive man with the reputation for finding and coaching the quarterback of the future—quite likely not on the roster as we speak—makes the most sense. This is still an open place. The Niners have favorable draft (picks 2, 34, 66 in the first three rounds) and cap positions to sell. Berman with Peyton Manning, 2007. Lots of takes on Berman in the mailbag. I’ll get to a few of them. Here’s mine: Before Berman and ESPN began the Sunday night highlights show in 1987, highlights on Sunday after the game existed only on SportsCenter or in brief on the post-game show if the late-window game didn’t run over. To give eight or 10 plays per game, and to actually have a plot line and storyboard for every game in the league was new and valuable and began to attract viewers by the millions. It’s one thing to see replays of two touchdowns in a 31-23 game; it’s another to tell the story of the game itself, with verve and fun. That’s a word, fun, that Berman made a part of everything he did. Did he stay too long? Did his shtick get old? I’m probably not the best one to ask; I’ve become less and less of a highlight viewer these days, because in recent years in the NBC studio or at home watching the Red Zone Channel on Sundays, I have no need to watch the highlights. I’ve seen the vast majority of them four times already. But if Berman stayed a year or three too long, big deal. That’s the way I look at it, because, to me, what he did in the first 15 or 20 years was incredibly valuable. He captained the ship that showed the highlights. He made them interesting when the games were not. And he had fun. Berman is not a journalist. He’s a fan, a cheerleader, a booster of the league. No hiding that. There’s a place for that. He filled it superbly, I thought. I am 57 years of age. Growing up, I thought, thanks to Steve Sabol and NFL Films, that nothing could be better than “This Week in the NFL” with Pat Summerall and Tom Brookshier. It was the absolute best highlight show of all-time (to the point I have bought old shows from those years to enjoy over again). But then came ESPN with “NFL PrimeTime” with Chris Berman and Tom Jackson (anybody remember that Phil Simms did it before TJ?). I have to say that this was the best thing on ESPN and that is saying something. They were the Red Zone Channel before Red Zone Channel. Not a shot at Chris Berman, but I think the comparison to Vin Scully is misplaced. Both were institutions and singularly unique in their own, different ways. Comparisons, especially poor ones, are a lazy man’s foil. I think Chris himself would likely tell you he’s no Vin Scully. But that doesn’t mean he wasn’t great in his own way. Thank you for the article. The baseball nicknames were something else. For some reason Jeff "Brown Paper" Bagwell always stuck out in my mind. 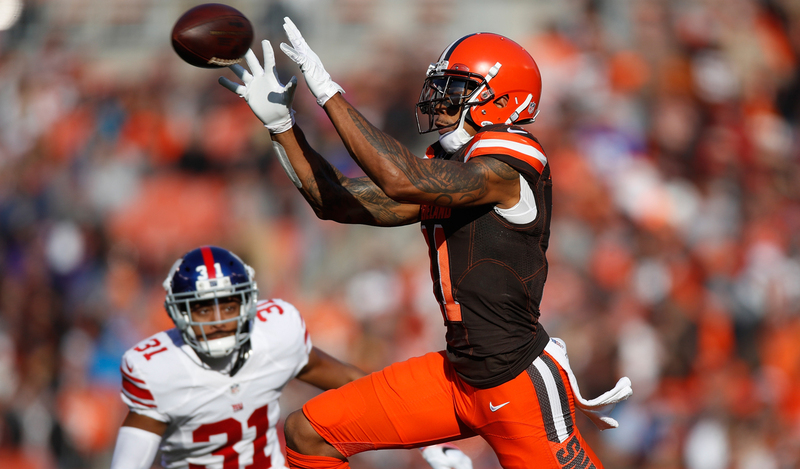 Terrelle Pryor might test the free-agent market after his 77-catch, 1,007-yard season with the Browns. When going through your award winner column last week, it got me thinking about the Comeback Player award. It always seems to go to someone coming back from an injury, which I can understand in some instances. However, I could not believe that Terrelle Pryor didn't get a single mention. By definition of the word comeback, there was not better candidate this year in my opinion. Pryor was out of full-time football almost two years. In addition he changed positions and in his first year as a wide receiver, he went over a thousand receiving yards with a QB merry-go-round all season. Excellent point, Dan. The comeback award is not defined very well. You could be coming back from a bad year, or from being injured, or from other circumstances. Now that I think of Pryor, I definitely would have had him on my list. • GIANTS WON’T BEND OVER BACKWARDS FOR BECKHAM: The Giants finally put their foot down and told Odell Beckham Jr. to grow up. Will he change, or will the edict ring hollow like the wall he punched? WHO BEAT THREE MVPS TO GET TO SUPER BOWL? The New Orleans Saints beat Kurt Warner (Arizona Cardinals) Divisional Round, Brett Favre (Minnesota Vikings) NFC Championship, and Peyton Manning (Indianapolis Colts) in Super Bowl 44. WHO DAT!? Very nice job, Steve. You’ve got a lot to be proud of with that 2009 team. What an inspirational article by Steve Tasker on the late Bruce DeHaven, his special-teams coach. I am quite biased when it comes to Bruce because he was a fraternity brother at Southwestern College; I did my practice teaching under him while he was the football coach at Oxford, Kan.; and he stood with me at my wedding 43 years ago. A small-town and small-college guy who never lost his way. Thanks to you and your staff for taking the time to pay tribute to my friend. I had the great privilege of knowing and becoming close friends with Bruce DeHaven over many shared NFL seasons, though none of them on the same staff. It is a great fraternity of which I was fortunate to become a member. Steve Tasker's tribute to Bruce in The MMQB is as fine a remembrance of an outstanding coach and even better person and friend as I have ever read. I had the opportunity to visit with Steve at Bruce's services on Saturday in Orchard Park, along with Mark Pike, Rusty Jones and Frank Muccia, Bruce's best non-football friend. It was a truly beautiful memorial filled with wonderful, warm memories and the hand-picked music (by Bruce) of his well-lived and fully blessed life. It seems the best among us are far too often gone too soon. Please pass along to Steve my thanks for a poignant and incredibly well written article. I owe a lot to Steve Tasker for taking the time to remember Bruce. We’re fortunate that one good man at such an emotional time of his life wanted to pay tribute to another good man, and Tasker did it well. Aaron Rodgers gets paid by State Farm to be a spokesman. The MMQB gets paid by State Farm to be a sponsor. Aaron Rodgers has a heck of a game on Sunday. Peter, please. You have been covering the NFL for a long time and you have been doing it well. So well that you have managed to build your own business around your trade. Of course you should report on Aaron Rodgers’ exploits. No apologies or “tricky…cheesy” feelings are necessary. It is business for you, for Aaron Rodgers, for State Farm, and for the NFL. I think most, if not all, readers of your column understand that money is the underlying driver of the NFL. When did it become politically incorrect to make a living, own/run your own business, be successful, and make a lot of money? In reality, having the ability to make the most of your opportunities, own a business, employ people, pay taxes are one part of what makes this country great. I think you have earned the trust of your readers to not think that you are a shill for State Farm in some payola scam. Keep on reporting the stories that are the stories, because you and your team do it really well. Thanks, Mike. I felt it was a good-enough angle to use, even though it would look silly and like I was overly promoting State Farm. Glad at least to you it came off okay. I couldn’t agree with you more about the unoriginal Divisional Playoffs name. But it’s just another instance of how the NFL just doesn’t have any imagination. Take the Super Bowl logos these days. Starting with 2010, the NFL stopped having colorful, creative logos for the game. Instead, they now have a generic silver and black logo with the Lombardi trophy over the host stadium. Every year it looks the same apart from a new Roman numeral. Boring, boring, boring. You’re right, Douglas. I hadn’t thought of the logos.